The President of the Senate, Dr. Abubakar Bukola Saraki, has told the National Chairman of the All Progressives Congress (APC), Comrade Adams Oshiomhole, to stop behaving like a rain-beaten chicken. Saraki said this in response to Oshiomhole’s statement that "senators elected on the platform of the APC will impeach the Senate president if he does not quit his position". 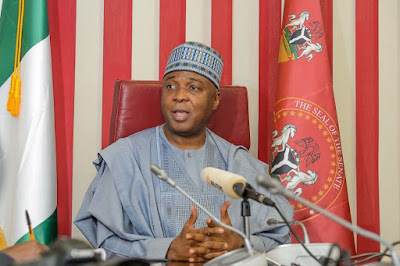 In the response by his spokesman, Yusuph Olaniyonu, Saraki said: “It is rather surprising that Mr. Adams Oshiomhole is behaving like a rain-beaten chicken, crying all over the place about Dr. Abubakar Bukola Saraki, as if the Senate President is the apparition haunting his life and the sinking ship that he captains. “The argument of APC that the Senate President must come from a majority party; that the Senate Presidency is their crown and National Assembly is their palace is only supported by ignorance and dangerous delusion. First, the issue of which party is in the majority will only be resolved when the Senate resume. Two, Section 50 (1) (a) of the constitution is clear that any Senator can be elected as Senate President. If the only thing left of the APC change agenda is to change the Senate President we can only wish them goodluck. “Perhaps, Mr. Oshiomhole needs to be better educated about our parliamentary history when he Stated that ‘For the first time in parliamentary history in Nigeria, we had a situation where the APC had majority of Senators and went on to elect a PDP as Deputy Senate President’. Where is Mr. Oshiomhole when Senator John Wash Pam of the Nigerian People’s Party (NPP) became Deputy Senate President in the Second Republic even when the National Party of Nigeria (NPN) had the majority. The same thing happened in the House of Representatives when NPP’s Rt. Hon. Edwin Umeh Ezeoke was elected Speaker in an NPN majority House. But then, it would require a level of education to understand these things. “He has made so much song and dance about Mr. Godswill Akpabio resigning as Senate Minority Leader when he left the PDP to join APC. For this, Akpabio has become his hero and a symbol of honour. He obviously does not understand that the post of Minority Leader is a strictly party affair. And the PDP simply decided who to give it as it is not even a position that was mentioned in the constitution. Whereas, the Senate President position is a constitutional creation, which required majority votes of all the members. Again, we don’t expect people whose only experience in politics is at the provincial levels to understand this. No wonder they are talking of crowns and inheritance. “Oshiomhole once again demonstrated his lack of sense of history by talking of Buhari winning more votes in Kwara than Saraki. We are sure President Buhari himself will disagree with the APC chairman. We invite the APC chairman to look at the figures of votes secured by the President in 2003, 2007, 2011 and 2015 to know that the difference is clear, like a commercial advert stated. Hmmm... Things are happening. Nigerians seize not to pray for our dear nation. God answers prayers. Only His will concerning d nation must stand, not what any man thinks or say.